At the end of November 2018 BGP Holdings received the final escrow monies from the 2016 sale. Our current estimate is that we will able to distribute around A$ 40 million. There are approximately 9.7 billion shares outstanding, hence A$ 0.004 per share. We have however been served a Notice of Dispute under the 2016 sale agreement by the Purchasers. We reject the (as yet unquantified) claim, but are restricted from distributing until the matter is cleared. We are presently in a dialogue with our counterparts to resolve the matter. On October 30, 2017 BGP Holdings PLC paid a second distribution of A$ 0.02060274 per share. This distribution was a capital reduction, as approved at the Extraordinary General meeting on July 3, 2017. We expect this to be the last material distribution. There may be a fraction of a cent at the liquidation of the Company in 18 months or so, depending on the release of €20 million held in escrow accounts relating to the 2016 sale of BGP Investment and warranty insurance, but it is too early to assess this likelihood. Investors will be kept informed of developments as they occur. At the Company's Extraordinary General meeting on July 3, 2017 in Malta all resolutions were approved. Hence a capital reduction of EUR 136 million has been authorised which will be paid as a distribution around mid-October following the statutory three month creditors' objection period. This will amount to AUD 0.0207 per share. Following the first interim dividend of AUD 0.05860935 per share paid on February 7, 2017 a second distribution, around AUD 0.02 per share, is expected in Q3, when the formalities of a capital reduction are completed. After this the companies will be liquidated, a process which will take around two years due to residual obligations under the sale contracts. There should be no material returns from the final liquidation process. Further to the company’s announcements in December 2016 an interim dividend of AUD $0.05860935 per share will be paid be paid on February 7. Advice to this effect has been sent to you or your custodian. If you have any problems accessing your statements, please contact the Share registry on 1800 115 044 (within Australia) or + 61 1800 115 044 (outside Australia) or email registrars@linkmarketservices.com.au. Floor Caving In on Europe Real Estate Stocks Bashed by Rates. European property stocks, already the worst performers this year, are flirting with a key technical level that, if breached, could signal more declines. Battered by rising bond yields and Brexit uncertainty, the Stoxx 600 Real Estate Index has slumped to its lowest level since 2014 relative to its parent gauge. Now, it’s on the verge of falling below a technical threshold that has acted as a support since 2009, which would be a bearish signal. EUROPEAN PROPERTY PORTFOLIO SALE COMPLETED. On 20 October 2016 the Board of BGP Holdings PLC announced it had reached agreement to sell 100 percent of the business and assets of BGP Investment S.á.r.l to purchasing vehicles advised by Morgan Stanley Real Estate Investing at an enterprise value of over €1.1 billion (A$1.58 billion) including net debt. At a Board meeting of BGP Holdings PLC, on 7 December it was resolved to transfer €407 million (approx. A$ 585 million) to The Trust Company (Australia) Limited, part of Perpetual Limited, as trustee of BGP Investment S.á.r.l (the Trustee). The Trustee’s intention is to make a preliminary distribution to investors in early 2017. This will be the first in a sequence of steps required to complete the distribution of proceeds of the transaction and effect the orderly winding up of the ultimate holding company. In 2017 the Board intends to make a second distribution to investors of approximately €160 million. To give effect to this investors will be asked to approve a resolution to authorise a reduction in the share capital of the company. Under Maltese law this resolution must be put to a General Meeting of the company which must take place not less than three months after the issuing of a notice of meeting. The notice of meeting will be sent to investors early in 2017. At that meeting investors will also be asked to approve Resolutions relating to any remaining fees and expenses relating to the sale, as well as a proposed budget to support the company through the remaining holdback period and cover the costs of its eventual liquidation. The remaining proceeds, approximately €20 million, will be held for a period of up to two years to satisfy any claims against the warranties provided by the company to the purchasers. The distribution of transaction proceeds represents a long awaited restoration of value to investors in BGP Holdings. It is important that investors seek independent professional advice to understand the taxation implications of the both the interim and final distributions of transaction proceeds when preparing their 2017 tax returns. BGP’s share registry provider Link Market Services Limited (Link) will be responsible for processing distributions to investors. In order to receive your distributions it is essential to ensure that Link has the correct bank account details for the crediting of your distribution. If you are an Australian investor or subject to Australia’s taxation laws, it is in your interest to provide us with your Tax File Number (TFN) or Australian Business Number (ABN) or Exemption Notification. Please note that we are obliged to deduct tax at the highest marginal tax rate in the absence of a valid TFN, ABN or exemption. # - Indicates a joint holding. As mentioned above the preliminary distribution is anticipated to be paid in early 2017, please ensure your details are updated by Monday, 30 January 2017. I am sure you will all agree that this is is an outcome that you have patiently waited many years to see and I look forward to receiving your support for the Resolutions to be put to the 2017 General Meeting of the company. You will find more information about the sale of BGP Investment S.á.r.l on the website of BGP Holdings PLC www.bgp-holdings.com. The journey to this point has been protracted and not without its challenges. Looking back over many years of detailed and painstaking hard work this is a remarkable outcome for a business which in 2009 had no value and negative equity, and is now able to return nearly €600 million to securityholders. Finally, may I say that we are indebted to a small group of talented and committed executives led by Managing Director, Mark Dunstan for achieving this result, notwithstanding the market impacts of the GFC and the current uncertainties in European markets generated by Brexit. Oct 21 China's sovereign wealth fund CIC has made a large investment in German residential real estate, adding to a string of recent buys of Chinese groups in Europe's largest economy, sources close to the deal said on Friday. German property group BGP has been sold to vehicles advised by Morgan Stanley Real Estate Investing (MSREF) at a value of more than 1.1 billion euros ($1.2 billion) including debt, BGP said in a statement. The bulk of the money involved in the deal came from CIC, two people close to the transaction said. CIC was not available for comment after regular business hours. China's shopping spree in Germany has hit the headlines this year with, among other acquisitions, Midea's 4.5 billion euro purchase of industrial robot maker Kuka. The BGP buy, however, is the first major Chinese investment in German homes. CIC and its co-investors beat out German property groups Vonovia and Deutsche Wohnen in the auction for BGP. A stock market listing had also been mulled as a divestment option. In August 2015, a planned sale of BGP to Austria's Conwert fell apart. BGP's apartments are located mainly in Berlin and North Rhine-Westphalia. The flats had represented one of the few large German property portfolios in private hands that had been up for sale. BGP was formed in 2005 as a joint venture between Australian investment group Babcock & Brown and property group GPT and at one stage was worth 4 billion euros. But many of its assets have been sold off. Babcock & Brown was liquidated in 2009, and GPT shareholders received shares in BGP. These securities were held mainly by funds and 58,000 primarily Australian retail investors. Lazard advised the sell side on the transaction. FRANKFURT (REUTERS) - China's sovereign wealth fund CIC has made a large investment in German residential real estate, adding to a string of recent buys of Chinese groups in Europe's largest economy, sources close to the deal said on Friday. German property group BGP has been sold to vehicles advised by Morgan Stanley Real Estate Investing (MSREF) at a value of more than 1.1 billion euros (S$1.66 billion) including debt, BGP said in statement. The bulk of the money involved in the deal came from CIC, two people close to the transaction said. CIC was not available for comment after regular business hours.China's shopping spree in Germany has hit the headlines this year among other with Midea's 4.5 billion euro purchase of industrial robot maker Kuka. Babcock & Brown was liquidated in 2009, and GPT shareholders received shares in BGP. These securities were held mainly by funds and 58,000 primarily Australian retail investors. Lazard advised the sell side on the transaction. The sale of BGP investment, its assets and subsidiaries closed in November. Audited closing accounts are being prepared and should be completed in February. Net proceeds are likely to attain nearly EUR 600 million, from which around EUR 10 million in transaction costs and taxes need to be deducted. In addition, some EUR 20 million will be held back for up to two years to give substance to warranty and indemnity insurance and legacy tax representations. BGP expects to distribute an interim dividend of around EUR 400 million around year end, with a further EUR 150 million in the first half of 2017. Our timetable is governed by the need to execute a capital reduction to release the second distribution, a process which will also require a general meeting of shareholders in the New Year. Morgan Stanley Real Estate Investing has swooped on German apartment owner BGP, which was spun off from the GPT Group in the depths of global financial crisis, with the €1.177 billion ($1.68bn) deal to see nearly 60,000 Australian investors receive a payout this year. The deal follows a dramatic turnaround in the fortunes of the venture that began with negative equity of about €600 million seven years ago, and will also be a fillip for major shareholders Stockland and GPT, as well as a series of hedge funds. BGP is understood to have entered talks with Morgan Stanley, believed to be acting on behalf of a Chinese firm, earlier this year and negotiated a deal through Brexit-related instability and softer sentiment towards European floats. BGP twice considered a float on the Frankfurt Stock Exchange and last year pursued sale talks with Austrian company ­Conwert ­Immobilien Invest. However, BGP chairman Rod McGeoch said the Morgan Stanley deal offered the best exit and had been struck before recent tremors in the specialist sector. The apartment portfolio spans 16,000 units in the German cities of Berlin, Kiel, Rendsburg and Cologne, with the sale price showing an uplift from an equity value of €588m attributable to shareholders last December. Mr McGeoch said funds available to distribute to BGP investors, after costs and debt repayment, amounted to almost €600m with the company planning to pay before Christmas. BGP has about 58,000 retail investors and is also held by investment firms Och-Ziff, Bennelong and Baring Capital. The result is a massive turnaround for investors who received BGP shares in the spin-off from GPT in 2009 as it reeled from debts associated with its European joint venture with investment firm Babcock & Brown. “The sale of the portfolio is a highly commendable outcome given the starting point in 2009 of a company with no value and negative equity to now being able to realise nearly €600m on behalf of our patient shareholders,” Mr McGeoch said. The turnaround transformed the business’s technology, rental system and its returns. Non-core investments were carved off and capital was poured into improving the apartments and business platform. Mr McGeoch said the deal marked the end of a long and at times difficult journey to restore value to the portfolio in often volatile markets. “Central to the success of this transformation was our strong focus on the German residential portfolio, increasing asset values by renovating the properties, reducing vacancies, increasing rents and increasing the efficiency and cost-effectiveness of our asset and property management,” he said. BGP also offloaded underperforming retail, commercial and light industrial properties, as well as less productive residential units. BGP’s success was driven by a small band of executives, led by managing director Mark Dunstan, a former investment banker who used his financial and property acumen to turn the once-struggling enterprise around. Mr McGeoch said an extraordinary general meeting would be soon convened to approve the distribution of the proceeds to investors. A final distribution will made next year once a number of smaller assets have been sold. Proceeds for distribution expected to be nearly €600 million after deduction of net debt and transaction expenses. BGP Holdings PLC (BGP Holdings) today announced the sale of 100 percent of the business and assets of BGP Investment S.à r.l. to purchasing vehicles advised by Morgan Stanley Real Estate Investing at an enterprise value including net debt of over €1.1 billion. After the fulfilment of customary conditions precedent and the sale completion, funds available for distribution after deduction of net debt and transaction expenses are expected to be close to €600 million (A$870 million). The final proceeds will be determined on the basis of closing accounts. BGP Holdings owns 16,000 residential units in Berlin, Kiel, Rendsburg and Cologne, and has approximately 58,000 retail investors following an in-specie distribution to shareholders in the GPT Group in 2009. German apartment owner BGP, which was spun off from the GPT Group during the depths of global financial crisis, will assess both a trade sale and a potential float, after exclusive talks to sell its €1.1 billion ($1.66bn) portfolio to Austrian company ­Conwert ­Immobilien Invest ended. Conwert revealed last Friday that it had resolved to end talks with BGP over the potential ­acquisition of the German residential property assets and management platform. “The administrative board of Conwert has decided that the acquisition strategically currently would not be in the best interest of Conwert and its shareholders,” Conwert said. BGP, dramatically restructured into a profitable player under managing director Mark Dunstan, remains confident about the prospects for its mainly Australian investors to exit. “We are looking at our options on both the M&A and IPO tracks. Markets are positive for both at present,” he told The Australian. While the deal for Conwert to buy BGP’s empire of about 16,500 apartments would have seen funds ­finally returned to about 58,000 small investors left holding BGP units when GPT split off its then toxic European property holdings in 2009, there is still strong demand for apartment portfolios. European equity markets have absorbed the impact from the Greek debt crisis and German residential property companies trade at substantial premiums. Some Australian fund managers have also pushed for the “price discovery” that a BGP float would entail. The Australian revealed in June that unstable European share­markets may prompt BGP to scrap a listing and opt for a trade sale of its portfolio. 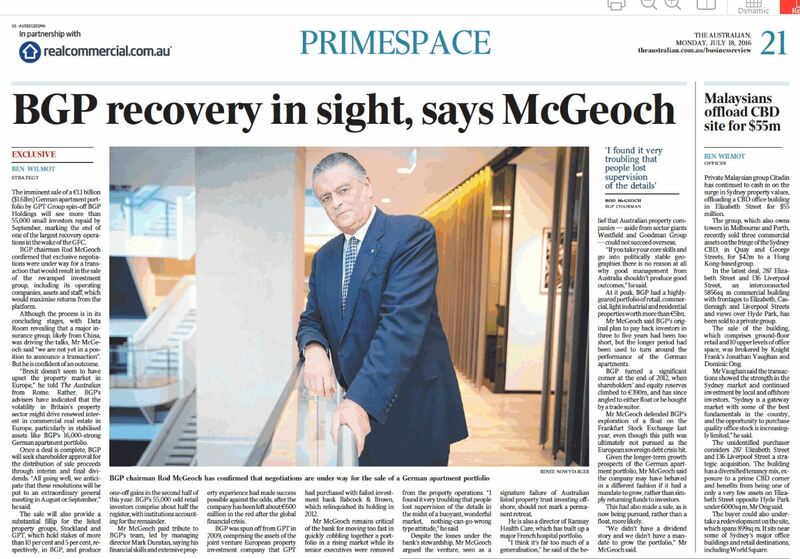 BGP chairman Rod ­McGeoch said then that market volatility had shifted the group’s thinking about a potential listing. But Conwert’s pullback from the portfolio could reignite tentative plans for September IPO launch. BGP last year tapped boutique house Lazard to advise on its ­options and Credit Suisse and JPMorgan were subsequently ­appointed to work on a potential float. The Administrative Board of conwert Immobilien Invest SE (“conwert”) today passed a resolution to end talks with BGP Holdings Europe S.à.r.l. with respect to the potential acquisition of the German residential property assets and platform of BGP Investment S.à.r.l., a subsidiary of BGP Holdings Europe S.à.r.l. After several weeks of detailed discussions, the Administrative Board of conwert has decided that the acquisition strategically currently would not be in the best interest of conwert and its shareholders. GPT Group is edging closer to finally exiting its disastrous foray into global property as the company it spun off in the depths of the global financial crisis, German apartment owner BGP, has entered exclusive talks to sell its €1.1 billion ($1.62bn) portfolio to Austrian property company Conwert Immobilien Invest. The move is likely to see Conwert buy BGP's empire of about 16,500 apartments and funds finally returned to about 58,000 small investors that were left holding BGP units when GPT split off its then toxic European property holdings in 2009. The sale will also clear the decks for incoming GPT chief executive Bob Johnston, who is due to start at the $7bn diversified property group by late January 2016. A sale will provide a small fillip to GPT's balance sheet, which has a 5 per cent stake in BGP, recovering a portion of the losses it suffered on the apartment buildings that first drew it offshore with failed investment bank Babcock & Brown. Stockland, which owns more than 10 per cent of the European company, as it received BGP units due the strategic stake it built up in GPT when then Stockland chief executive Matthew Quinn had designs on merging the property giants, will also benefit. BGP's portfolio peaked at nearly €4bn of assets during the boom but had shrunk back to €2.3bn by 2009 and the business was dramatically restructured under managing director Mark Dunstan, who declined to comment yesterday. The Australian revealed last month that the ongoing Greek debt crisis and unstable European sharemarkets may prompt BGP to scrap a planned stockmarket listing and opt for a trade sale of its €l.1bn apartment portfolio. BGP chairman Rod McGeoch said market volatility had shifted the group's thinking about a potential listing in Europe. The company had tentatively identified September as the next window for an IPO. However, European institutions have been buying up apartment portfolios directly as the sector consolidates. In April, Conwert itself fended off a €980m offer for its portfolio of 30,000 German and Austrian units from rival Deutsche Wohnen. Mr McGeoch emphasised BGP's desire to only sell the portfolio for more than its net asset value of about €700m and 58 trade buyers signed nondisclosure agreements to look at the apartments. Conwert said it was "currently conducting a comprehensive due diligence review of the relevant assets. Conwert has not until now entered into any binding agreements concerning the potential acquisition of the relevant assets and the outcome of the related discussions is completely open". The Australian last year revealed that BGP had tapped boutique house Lazard to advise on its options and Credit Suisse and JPMorgan were subsequently appointed to work on a potential float. French group BNP Paribas and Germany's Berenberg Bank were also providing assistance on the float that was expected to raise €300m- €500m. The steadying of European property markets over the last two years and exceptionally low global bond rates have helped large parcels of residential real estate assets in Germany trade at substantial premiums. BGP's original property portfolio spanned Europe, with properties ranging from shopping centres in Spain and real estate in Sweden, Holland, France, Lithuania and Germany. The imminent sale of a €1.1 billion ($1.61bn) German apartment portfolio by GPT Group spin-off BGP Holdings will see more than 55,000 small investors repaid by September, marking the end of one of the largest recovery operations in the wake of the GFC. BGP chairman Rod McGeoch confirmed that exclusive negotiations were under way for a transaction that would result in the sale of the revamped investment group, including its operating companies, assets and staff, which would maximise returns from the platform. Although the process is in its concluding stages, with Data Room revealing that a major insurance group, likely from China, was driving the talks, Mr McGeoch said “we are not yet in a position to announce a transaction”. But he is confident of an outcome. “Brexit doesn’t seem to have upset the property market in ­Europe,” he told The Australian from Rome. Rather, BGP’s ­advisers have indicated that the volatility in Britain’s property ­sector might drive renewed interest in commercial real estate in Europe, particularly in stabilised assets like BGP’s 16,000-strong German apartment portfolio. Once a deal is complete, BGP will seek shareholder approval for the distribution of sale proceeds through interim and final dividends. “All going well, we anticipate that these resolutions will be put to an extraordinary general meeting in August or September,” he said. The sale will also provide a ­substantial fillip for the listed property groups, Stockland and GPT, which hold stakes of more than 10 per cent and 5 per cent, respectively, in BGP, and produce one-off gains in the second half of this year. BGP’s 55,000 odd retail ­investors comprise about half the register, with institutions accounting for the remainder. Mr McGeoch paid tribute to BGP’s team, led by managing ­director Mark Dunstan, saying his financial skills and extensive property experience had made success possible against the odds, after the company has been left about €600 million in the red after the global financial crisis. BGP was spun off from GPT in 2009, comprising the assets of the joint venture European property investment company that GPT had purchased with failed investment bank Babcock & Brown, which relinquished its holding in 2012. 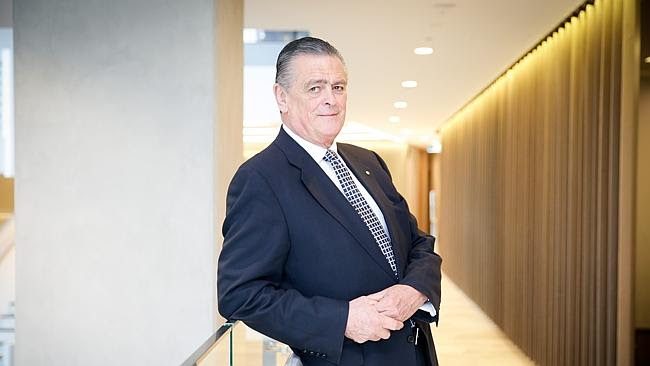 Despite the losses under the bank’s stewardship, Mr McGeoch argued the venture, seen as a ­signature failure of Australian ­listed property trust investing offshore, should not mark a permanent retreat. He is also a director of Ramsay Health Care, which has built up a major French hospital portfolio. “I think it’s far too much of a generalisation,” he said of the belief that Australian property companies — aside from sector giants Westfield and Goodman Group — could not succeed overseas. “If you take your core skills and go into politically stable geographies there is no reason at all why good management from ­Australia shouldn’t produce good outcomes,” he said. At it peak, BGP had a highly-geared portfolio of retail, commercial, light industrial and residential properties worth more than €5bn. Mr McGeoch said BGP’s original plan to pay back investors in three to five years had been too short, but the longer period had been used to turn around the ­performance of the German apartments. BGP turned a significant ­corner at the end of 2012, when shareholders’ and equity reserves climbed to €390m, and has since angled to either float or be bought by a trade suitor. Mr McGeoch ­defended BGP’s exploration of a float on the Frankfurt Stock ­Exchange last year, even though this path was ultimately not ­pursued as the ­European sovereign debt crisis hit. Given the longer-term growth prospects of the German apartment portfolio, Mr McGeoch said the company may have behaved in a different fashion if it had a mandate to grow, rather than simply returning funds to investors. This had also made a sale, as is now being pursued, rather than a float, more likely. “We didn’t have a dividend story and we didn’t have a mandate to grow the portfolio,” Mr McGeoch said. It has taken seven years for one of the worst casualties of the reckless, debt-fuelled expansion indulged in by Australia’s listed property sector in the mid 2000s to finally be laid to rest. But after a lengthy wait, investors in GPT Group’s disastrous European joint venture with the failed investment firm Babcock & Brown are on the brink of recovering some money. In 2009 BGP Investments almost up-ended GPT. Its sprawling portfolio of European real estate spanning the residential, industrial and retail sectors reached a peak valuation of more than $7.1bn in September 2008 but when the credit crisis hit, the vehicle’s value collapsed under a $5.1bn debt burden. In an effort to avoid tumbling into the abyss, GPT offloaded most of the assets at fire sale prices and spun out the remainder of the portfolio in an in distribution that ascribed zero value to the fund’s shares. The decision singed the property giant’s arch-rival, Stockland Property, which still owns close to 12 per cent of the vehicle and burnt its army of retail investors. But the prospect of hoovering up BGP’s shares for free also lured in a bevy of high-profile opportunists, including the US hedge fund Och-Ziff. Now investors look set to be rewarded for their patience. At BGP Investments’ annual general meeting yesterday in the sun-soaked Mediterranean island of Malta, management conveyed the good news: a trade buyer is in exclusive negotiations to buy the entire portfolio, which now consists of apartments mainly located in Berlin and North Rhine-Westphalia. It is understood the suitor is a Chinese insurance firm, and has agreed to pay a small premium to the assets’ value of €1.1bn. In a stark improvement on the in specie issue price, shareholder equity now stands at €580m. The trouble is investors have faced false dawns in the past. Last year investor hopes were pinned to a prospective initial public offering that failed to materialise and prior to that a trade sale to an Austrian company mysteriously fell through at the last minute. However the upbeat tone struck at the AGM by the vehicle’s chairman, businessman Rod McGeoch, indicates it will be a case of third time lucky for BGP’s shareholders after a seven-year stretch without any income from the fund. If a deal is concluded over the next few days the proceeds from the sale will dispersed via an interim and final distribution. A transaction will draw a line under one of the most sensational blow-ups in the property sector from the pre-GFC era. One investor in the fund told DataRoom the GPT and B&B European JV epitomised the hubris that presided back then and should be remembered by the industry as a salutary tale when considering offshore expansion strategies. Conwert Immobilien Invest SE announced in an ad-hoc disclosure that it is currently in exclusive negotiations with BGP Holdings Europe S.à.r.l. regarding a potential contract for the acquisition of the German residential properties of BGP Investment S.à.r.l., which are currently managed by BGP Asset Management. As explained on multiple occasions BGP is examining a dual track-exit. This entails the possibility of a global sale of the German residential real estate portfolio including the operational management company, as well as the option of going public. BGP is currently in exclusive negotiations with Conwert Immobilien Invest SE, but at this point no agreement has been reached on a possible acquisition. BGP will continue to consider an initial public offering. Please note that we cannot comment further on ongoing negotiations. Concarus Real Estate Invest, a company in the May & Porth group, has acquired a shopping centre in Kelheim near Regensburg, Lower Bavaria. Luxembourg&dash;based BGP Investment, advised by Internos Global Investors, was the seller. The retail park on Schäfflerstrasse has a rental area of 19,000 sqm plus 600 parking spaces. The largest tenants are Edeka, Hagebaumarkt, C&A, Norma, and Deichmann. Concarus said it would continue the current revitalization of the centre. BGP is currently selling its Germany retail portfolio in order to focus on its core business of residential real estate. BGP sells down final assets of Residential Joint Venture with Oxford Properties. ADLER Real Estate AG, Frankfurt am Main, Ger-many has successfully completed the acquisition of a portfolio located in Lower Saxony comprising c. 6,750 residential units in Wilhelmshaven, a transaction that was notarised in Q4 2014. BGP Investment has completed a €160 million refinancing of its Bundaberg German Residential portfolio with Berlin Hyp. The 7 year loan completes the overall refinancing of BGP's Resi assets which commenced in 2013 with the launch of the Monnet Finance CMBS issue. The Bundaberg portfolio consists of just over 4,000 units largely in the Berlin, Schleswig Holstein and North Rhine-Westphalia regions of Germany. INTERNOS Global Investors Limited ('INTERNOS'), the €4 billion owner-managed real estate fund management firm, has sold MKV, a mixed-use retail/logistics asset in inner Munich, Germany, to MCAP Global Finance, Ltd., a wholly owned subsidiary of New York based investment adviser Marathon Asset Management. The disposal was completed on behalf of BGP Investment, the former joint venture between Australian companies Babcock & Brown and the GPT Group. The asset is located at 161 - 179 Landsberger Strasse in Munich and comprises 4.4 hectares of land with 57,657 sq m of lettable space as well as 609 car parking spaces. The property is well-let and anchored by Bauhaus, which occupies a 13,200 sq m unit. Other tenants include Galeria Logistik (Kaufhof), Zeitlager Self Storage, Prosegur and Staples. Reed Smith and Pohlmann & Company advised vendor and purchaser respectively. The investment vehicle that GPT Group spun off in the depths of the global financial crisis to hold its stake in a series of European assets has appointed investment bank Lazard to advise on exit strategies that could see its €1 billion-plus German residential portfolio floated in Europe or sold off privately next year. BGP Investment has sold the HBI Netherlands portfolio (HBI), to Hansteen Holdings PLC for a total consideration of €106 million. BGP was advised by Internos Global Investors in the sale. HBI Netherlands portfolio comprises 41 light industrial assets located across the Netherlands, predominantly in the Randstad area. The total size of the portfolio extends to 370,000 sq m with over 360 tenants in occupation. The sale permits BGP to further focus on the German residential sector. INTERNOS Global Investors Limited, the €4 billion owner-managed real estate fund management firm, announces the acquisition of its first two retail park assets in Rottenburg and Moosburg (Bavaria), Germany for €15.9m. The Moosburg asset is anchored by Kaufland on a lease to 2021; at Rottenburg the income is secured to Rewe & Lidl on leases fixed to 2020 and 2017 respectively. The assets were sold by Luxembourg-based BGP Investment as part of its strategic shift to a focus on German Residential assets. The acquisitions were made by Internos on behalf of the 'Novapierre Allemagne' fund; a JV with PAREF Gestion and the first SCPI-structured fund to invest French capital exclusively into German retail parks. Lefèvre Pelletier & Associ&ecute;s advised Novapierre Allemagne and Reed Smith advised BGP Investment. Deutsche Bank AG arranged 406 million euros ($535 million) of commercial mortgage-backed bonds for real estate investor BGP Investment Sarl. BGP Investment Sarl, a Luxembourg-based real estate investor, hired Deutsche Bank to arrange about 386 million euros ($517 million) of commercial mortgage-backed bonds. THE investment company that GPT Group spun off in the depths of the global financial crisis to hold its stakes in a series of European assets has made a 1 billion ($1.5bn) turnaround. The group, BGP Investment, has shaken off its uncertain beginnings to emerge from the once-perilous European property and finance markets as a slimmed down owner of apartments and shopping centres focused on cities in Germany, including Berlin. German housing group LEG, which floated on the stock market in January, has bought 2,200 apartments on its home turf North Rhine-Westphalia from a group led by Luxembourg listed fund BGP, and said it is looking to add a further 8,000 units. Price was not disclosed. The new portfolio generates €6m annual net cold rent for an average of €4.74 per sq.m., at a vacancy rate of 8%, and plans to reduce the latter and realise moderate rental growth through cap ex measures. "With the forecast contribution to FFO, the new portfolio exceeds LEG's yield expectations," said CEO Thomas Hegel in a statement. LEG already has significant own holdings at the new portfolio locations - Dortmund, Essen, Bochum and Witten amongst them - and expects synergies. The new portfolio brings its holdings up to 93,000 residential units. Further portfolios are in advanced stages of due diligence, and the company disposes of adequate liquidity, he added. It aims to add another 8,000 units before year end 2014. "LEG Immobilien is consistently implementing its growth course," said Hegel. The group is also in negotiations on an acquisition credit line for a more flexible and quick reaction time. LEG's IPO at the end of January brought in €1.34bn for then-majority owners Goldman Sachs' Whitehall Funds and Perry Capital, and made it Germany's largest listed property company by market cap. Its share price reacted positively to the news, ending Friday at its highest close yet, €45.30, and above its IPO listing price of €44. BGP Investment started as a joint venture between Australian listed giants Babcock & Brown and the GPT Group in 2005 and was restructured in 2009 as an independent company with over 55,000 shareholders. Babcock & Brown exercised a put option in 2012 and exited all but a small share or the group. Structured through holdings registered in Malta and Luxembourg, BGP owns some €1.6bn in property in Germany, France, the Netherlands, Denmark and Sweden. Swiss-based Feondor acted as transaction manager for the consortium - from Property Investor Europe. BGP has sold its Swedish light industrial assets to a local institutional investor as part of its strategy of divesting non-core portfolios. Price is not disclosed. BGP was advised by Hestia Fastighetsförvaltning AB. BGP Investment and its subsidiaries in Germany have settled all remaining litigation relating to legacy issues inherited from the Babcock & Brown / GPT joint venture era. The two most recent cases have been either dismissed from court or settled at a level well below provisions. BGP management is pleased to state that there is no longer any material litigation threatening the group, which was apparently an issue in recent rating agency statements. A Berlin based family office has acquired a 75% participation in BGP Investment's Braunschweig portfolio via a share deal, valuing the property at €15 million. The 480 residential and two commercial units are located in the Heidberg quarter of Braunschweig. BGP Investment retains a 25% stake and BGP Asset Management will continue to manage the portfolio together with the incumbent property manager Hermes. BGP was advised by Clifford Chance. An investors' joint venture around BGP Investment has sold parts of the Candlepower portfolio to the Hanover-based investor BAUM Unternehemensgruppe. The sub-portfolio is made up of 966 residential units in Hanover, Garbsen and Langenhagen. The joint-venture acquired the portfolio in 2006 and 2007, has since restructured and repositioned it, and has now sold it to BAUM Unternehmensgruppe. One of the core competencies of BAUM Unternehemensgruppe is the purchase and sustainable management of residential real estate. In buying the Candlepower residential units, BAUM Unternehmensgruppe has increased its apartment stock to a total of 4.500 units. Feondor Asset Management GmbH, the current asset manager of the Candlepower portfolio, is responsible for restructuring and repositioning the assets and has also acted as transaction manager for the investors' joint venture. The parties have not disclosed the purchase price. Internos Real Investors has completed two disposals in Germany for EUR 36.2 mln on behalf of BGP Investment. Internos Real Investors, the EUR 1.5 bn owner-managed real estate fund management business, is the asset and investment manager.The first disposal is of a portfolio of five modern retail parks in Bavaria and Rhineland-Palatinate, sold to a fund managed by Cordea Savills for a total of EUR 17 mln, representing a price of EUR 1,300 per sq m2.The portfoliom which is 100% occupied, comprises 13,193 m2 of lettable area occupied by 18 tenants with an average lease expiry of 7.5 years.The second disposal is of a retail warehouse unit 14 kilometers north-east of Berlin which has been sold to a listed Israeli investor for EUR 19 mln, representing EUR 1,225 per m2. The property, comprising 15,500 m2 of lettable area, is let to Selgros Cash and Carry until December 2019. Mark Dunstan, CEO of BGP Investment commented: 'We are pleased with this result. BGP's current strategy is to continue selling down quality retail assets into a rising market to maximise shareholder value. 'Matt Walker, head of fund management at Internos Real Investors added: 'BGP's German retail portfolio ranges from supermarket anchored retail parks to significant shopping centres in Bavaria, with an average occupancy of 99%. Individual assets and portfolios are being progressively released when pricing meets BGP's expectations. BGP Investment s.à r.l. (BGP) and CORESTATE Capital AG, Zug (CORESTATE) have entered into a comprehensive agreement in respect of approx. 4,700 apartments located predominantly in Western Germany. The portfolio comprises over 300,000 sqm of lettable space and currently carries approx. €150mn of debt financing. Under the terms of the proposed transaction, a holding company of CORESTATE Group will be assuming ownership of the portfolio from BGP and implementing a comprehensive investment and capital expenditure programme. The transaction remains subject to consents to be granted by - inter alia - the existing financing parties. This consent has to be obtained by the end of February 2010 for the transaction to complete successfully. BGP Holdings today announced the appointment of Mr Rod McGeoch as Chairman of BGP Holdings PLC and director of BGP Investment s.à r.l., the European joint venture investment vehicles in Malta and Luxembourg which were the subject of the in-specie distribution made by GPT to unitholders in August this year. Mr McGeoch's appointment will take immediate effect. Copyright 2014 BGP INVESTMENT s.à r.l. All rights reserved.